I guess I can some up my gripes as follows. First, from a cerebral perspective, there's a cognitive dissonance. 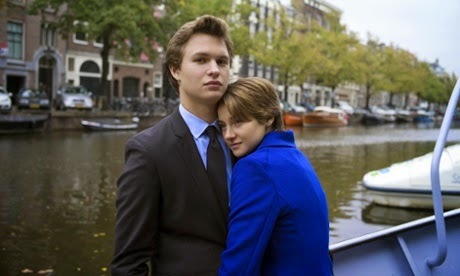 The whole point motivating narrative of the story is that Hazel Grace (Shailene Woodley - THE DESCENDENTS) gives Augustus Waters (Ansel Eglort) her favourite book by the aforementioned author - a book that she describes as being the only one that ever described how she felt as a cancer sufferer - the book that they travel to Amsterdam to hear explained. But I found myself asking whether this movie, if seen by a teenage cancer sufferer, would provide the same service? Would it live up to the ideal of being authentic and uplifting and empathetic? Does it describe something real and admirable and truly tragic? For me the answer is no. Because nothing about how these kids look, feel and are whisked on a magical journey felt real - and because of that, using cancer felt exploitative. My second gripe comes from the heart. The movie just didn't make me cry - maybe because of the artifice I mentioned before and in spite of the genuine chemistry between it's two lead characters. In fact, the character who moved me most - who's anger and frustration seemed more real, was Augustus' friend Isaac (Nat Wolff). So basically, it's a thumbs down for THE FAULT IN OUR STARS because I disagree with the very contradiction at its heart - the authentic book that is embraced by the in-authentically perfect suffering couple. I guess what that means is that I wanted to see a movie based on the fictional novel by Peter van Houten rather than THIS movie based on THIS book by John Green. Can I really criticise this movie for not being another movie? It's well enough made, after all? Perhaps I am being unfair. All the same, it's just not for me. THE FAULT IN OUR STARS has a running time of 126 minutes and is rated PG-13. The film is currently on release in the USA, Egypt, Jamaica, Trinidad, Australia, Brazil, Belarus, the Czech Republic, Croatia, Hungary, Kazakhstan, Lebanon, New Zealand, the Philippines, Puerto Rico, Russia, Slovakia, Austria, Canada, Estonia, Iceland, Latvia, Mexico, Poland, South Africa, the UAE, Bahrain, Switzerland, Chile, Germany, Denmark, Iraq, Jordan, Kuwait, Montenegro, Macedonia, Oman, Qatar, Serbia, Bulgaria, Norway, Romania, Belgium, Israel, Dominican Republic, the UK, Greece, Ireland, Portugal, Singapore, Cyprus, Lithuania and Sweden. It opens in Cambodia on June 25th, in Argentina and Uruguay on June 26th, in Ecuador and Turkey on June 27th, in Spain, India and Venezuela on July 4th, in the Netherlands and the Ukraine on July 10th, in Finland on July 11th, in Thailand on July 24th, in Malaysia on July 31st, in Hong Kong on August 14th, in France on August 20th, in Indonesia and Taiwan on August 22nd, in Slovenia on August 28th, in Azerbaijan and Italy on September 4th.